Be Likable, the Art of Doing a Good Interview - Veritas Communications Inc.
Ken was a new believer. His job was to program our radio stations. He was good. I was young. I paid attention to what he said because I wanted to learn. One day he said, “You know what Don? Common sense isn’t nearly as common as people think it is.” Now, decades later, I still remember it. What I want to share here ought to be common sense but often isn’t. If it is for you, forgive me in advance. We refer to something as prima facie which means self-evident or apparent. Some of these reminders fit this definition. Others may be fresh or simple reminders about the interview process. Stay on topic. If an interviewer asks you a question that is off topic, bring the interview back around to the topic. Avoid being pulled into opinion or ideas that are not part of your area of expertise. Listen for bumper music. If you hear music playing this means the host is going to a break. Wrap up your comments as quickly as possible and make a smooth transition. Enthusiasm motivates. People are inspired to listen to you or purchase your book if they know you are excited about the topic. Be upbeat. Be engaged. Be inspiring. Over-spiritualizing turns listeners or viewers off. Avoid coming across as preachy. Try to limit how much you quote the Bible. Stories matter. Tell them. Keep telling them. Tell on yourself. Use them to accentuate the main points you want to make. Humor works. It makes a host and the audiences think you are relaxed even if you don’t feel that way. Distractions distract. Trains, planes and automobiles. Dogs, kids, jack hammers, phones. You get the picture. Eliminate them before you go on an interview. Short answers die. If you are doing a ten minute interview short answers are fine. If you are thirty minutes or longer, don’t hesitate to talk until a host interjects or you run out of words. Be ready. If you were running a 10K race wouldn’t you do some preparation before you stood at the starting line? Do the same with interviews. Learn about the host, the coverage, the audience, the focus of the show. Don’t overthink the interview. This means that when you have done everything you can to be ready; trust God for the results and give the best interview you can. Remember, you are the expert. 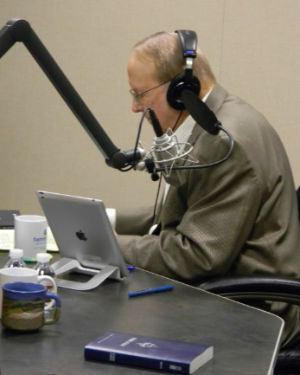 The photo of Dr. James Dobson was taken while I was in-studio at Family Talk a couple years ago. What do you notice about it? He’s studying for his interview. He has a Bible nearby. He has a computer screen, a pen to write notes, and something to drink. This says volumes about him but also about what a good interviewer does to be ready. A good guest does the same. As one radio host said to me this morning, “The idea is to get people to buy your book and for that to happen, they have to like you.” Be likable.